History of Allen Beverages, Inc.
Allen Beverages, Inc., was founded in August 1947 by Cleve Allen and began as Spur Bottling Company in Gulfport, Mississippi, with the Canada Dry franchise for the six southernmost counties in Mississippi. The first delivery was made in September 1947, just one day before the 1947 hurricane. The fleet consisted of one army surplus truck. Nesbitt Orange was added in January, 1948. In 1955, the Pepsi-Cola franchise was obtained from the Pepsi-Cola Company. Hurricane Camille in 1969 left the plant virtually unscathed, however a disastrous fire completely destroyed the plant located on Hewes Avenue across from the old airport terminal in 1972. The plant was rebuilt at the same location. Cleve Allen was joined in 1975 by his son, Drew Allen. In 1987, the plant moved from Hewes Avenue to its present location on Dedeaux Road in Gulfport. Drew Allen became President and CEO shortly before the death of his father in July 1991. Late 1991, Allen Beverages, Inc., acquires Seven-Up franchise which was later replaced with Sierra Mist. In 1997, we celebrated our 50th Anniversary in business! In January 2010 – Andrew Allen, Drew’s son joined the company to start his professional career welcoming the 3rd Generation to the company. In June 2011 – Wesley Batson, Drew’s nephew joins the company. In January 2012 – Grace Allen, Drew’s daughter joins the company. Other products added to Allen Beverage’s line include: Lipton Tea, Dole and Ocean Spray juices, Sunkist Orange, Hawaiian Punch, Starbucks brands, Aquafina Water, Sobe, Hogwash, Muscle Milk, Rockstar, AMP, and Gatorade. 1898 – Pepsi-Cola formula created by pharmacist , Caleb Doc Bradham, in his drug store in new Bern, North Carolina. It was first sold under name Brad’s Drink. 1903 – Bradham officially registered Pepsi-Cola as a trademark and formed his own company. Although carbonated beverages were considered healthful and therapeutic, he simply advertised the drink as delicious. In the early days, it was quite dangerous to bottle carbonated beverages. A pedal pump was used to fill a wire stopper to crown and a mask worn to protect against bottle explosions. Bottles were cleaned with lead shot and had no uniformity. Sometimes beer bottles were used and deliveries made by horse or mule and wagon. 1916 – Pepsi-Cola Bottling franchises had now been issued to more than 100 bottlers. Drink was sold in 6-ounce bottles for five cents. 1920’s – Price of sugar skyrocketed shortly after World War I and the company fell into a series of bankruptcy and management changes. 1931 – Loft, Inc., a chain of northern candy stores, bought 80% of Pepsi-Cola Company when the leading soft drink company refused to give Loft a discount on its syrup. 1933 – Pepsi-Cola introduced a 12-ounce bottle selling for five cents and advertised it as Aa nickel drink, worth a dime. Sales soared almost overnight as bargain-seeking, depression work Americans made Pepsi a national favorite. 1949 – Major competition outselling Pepsi six to one. New management team took over under the leadership of Alfred N. Steele and Herbert L. Barnet. Pepsi was made less sweet and lower in calories. Refresh without filling was the new theme. Sales personnel quadrupled. Franchises upgraded. Large chains of supermarkets and drug stores were opened to Pepsi. Packaging, promotion and advertising were all upgraded. Plant expansions and re-investment in equipment exceeded anything ever seen in the industry. 1950’s – Company truly came of age. Case sales rose 182%, a far greater growth than the rest of the industry. Earnings per share rose from $.22 to $2.10. Net income of company rose from $1 million to over $2 million. Stock rose from $8.00 to over $40.00 a share. 1954 – Pepsi-Cola International LTD was created to handle increasing foreign business. New plants opened at the rate of 30 per year in territories and countries throughout the world. 1958 – New Pepsi swirl bottle introduced. 1959 – World Headquarters of Pepsi-Cola opened at 500 Park Avenue, New York City. 1970 – Moved headquarters to Purchase, New York. 1975 – Pepsi-Cola took over lead in take-home market. 1985 – Pepsi-Cola gains market share as Coca-Cola tries new Coke. 1990’s – Mountain Dew and Pepsi-Cola grow by leaps and bounds in the take-home market. 1999 – Aquafina Water becomes the number one bottled water in the country. 2000 – PepsiCo, Inc. reaches agreement to acquire a majority stake in South Beach Beverage Company, whose highly innovative SoBe brand has made it one of industry’s most successful companies. 2003 – Pepsi-Cola launches Sierra Mist in the United States. Pepsi-Cola trademark turns 100 years old. 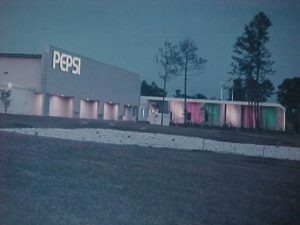 2005 – PepsiCo celebrates its 40th anniversary. 2006 – Pepsi celebrates its participation in its 20th consecutive Super Bowl. Indra Nooyi named chief executive officer of PepsiCo. Pepsi acquires IZZE Beverage Company. 2010 – PepsiCo completed the acquisition of The Pepsi Bottling Group, Inc. and PepsiAmericas, Inc., its two largest anchor bottlers. AMP Energy Juice launches across the United States. 2012 – Diet Mountain Dew, Brisk and Starbucks ready-to-drink beverages join PepsiCo’s portfolio of billion-dollar brands, bringing the total to 22. 2014 – Pepsi introduces Pepsi Spire, a portfolio of innovative fountain beverage dispensers. Consumers can create more than 1,000 customized beverages with the touch of a button. 2015 – PepsiCo celebrates its 50th anniversary as a combined food and beverage company.